Inventory investment is one of the factors driving the business cycle. One of the characteristics of most of the post-1990 experience is lowered inventory investment volatility (in the developed countries), although that changed around the Financial Crisis. 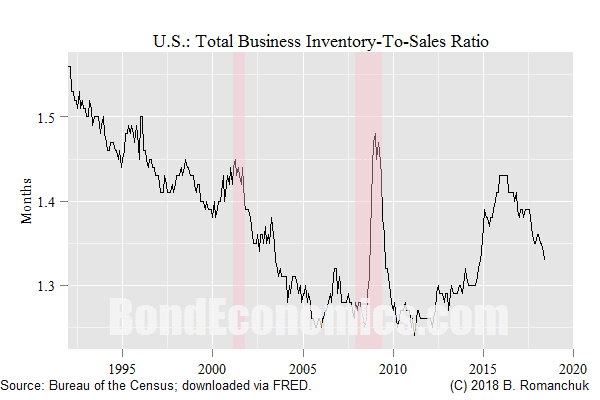 I have some doubts that we could use inventory trends to forecast the cycle, rather their importance is the tendency to magnify the effects of a recession. 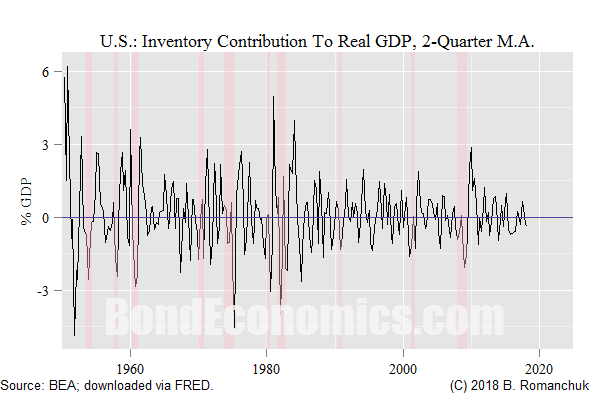 The chart above shows the contribution to real GDP growth in the United States that is the result of changes to private inventories, at an annualised rate. In order to smooth down this extremely noisy series, the two-quarter moving average is displayed. If we first look at the series for the period from 1950 to the mid-1980s, we see large oscillations around recessions (marked in pink), with the magnitude of the swings around 3% of GDP. Recessions were more frequent, reflecting the stop-go policies of the post-war Keynesian consensus. After the mid-1980s, the oscillations were generally more subdued. Meanwhile, recession frequency has dropped off, with roughly a decade between them. Only the Financial Crisis recession generated an inventory cycle comparable to the pre-1980 experience. This can be readily explained by changing business practices. Holding inventories is a form of investment, which consumes capital and cash. Modern management wishes to keep investment on a short leash, so that return on equity is greater. Hence the attraction of just-in-time inventory management. Furthermore, manufacturing industry is the major driver of inventory investment: each manufacturer in a production chain needs to hold an inventory of both inputs and outputs. By contrast, most service industries need to hold little inventories. By outsourcing manufacturing to developing countries, the volatility of the inventory cycle has been pushed off the national accounts of the developed economies. Hence, discussions of business cycle dynamics need to keep in mind the historical era. Inventory investment matters greatly for early post-war cycles, but is barely remarked upon in recent decades. At most, inventories are of interest to industry-level analysis, the motor vehicle sector in particular. In order for inventory information to be useful for business cycle analysis, we need to be able to forecast trends. The usual approach from financial market economic analysis as well as post-Keynesian theory is to look at the inventory-to-sales ratio. The figure above shows the trend in this ratio since 1992 for the total business sector in the United States. The inventory-to-sales ratio is a comparison of a stock variable (inventories, measured in dollars), and a flow variable (sales, measured in dollars per month). The ratio therefore has a unit of months; that is a ratio of 1.3 implies that firms are holding 1.3 months worth of sales in inventory. Some commentators argue that we cannot mix stock and flow variables, but that is not precisely correct. It is usually safe to compare stocks with stocks or flows with flows, and the units are natural. For example, it is reasonable to compare the ratio of sales in Canada for global sales for a multinational; the percentage gives us the relative importance for Canada for the firm. When we compare stocks to flows, the ratio will depend on the accounting period used for flows; for example, inventories divided by quarterly sales will normally be about one third of those if we used monthly sales; but if we were careful with our time axis, the results would be comparable. In stock-flow consistent modelling (SFC models), models typically assume that behaviour is based on stock-flow norms. 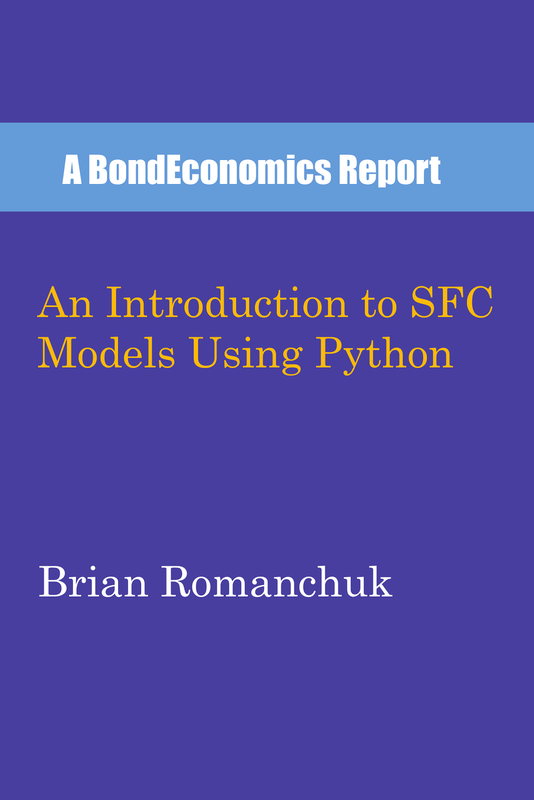 (My latest book, An Introduction to SFC Models Using Python, describes SFC models.) Firms make production decisions based on the expected level of sales, as well as the deviation of the desired level of inventories. Once we fix the expected level of sales in the upcoming period, firms can then determine the level of production that nudges the ratio toward a target level. If we are in a state of steady growth, production will be slightly higher than expected sales, as the production will need to meet sales, as well as grow inventories in line with sales growth (to keep the ratio at target). Of course, the problem is when sales fall, and are expected to remain at a lower level. Not only does production need to be cut back to match lower expected sales volume, inventories need to be reduced further to cut the ratio toward target. Such an inventory cut is not purely the result of convention; inventory investment represents a drain on cash. That is, value has migrated from the "cash" entry to the "inventory" entry on the asset side of the balance sheet. In a recession associated with a financial crisis (which modern recessions have been), short-term lending dries up, and there is a dash for cash. Inventory liquidation provides that cash. If we return to the modern U.S. experience, we do not see a lot of support for the belief that there is a "normal" level for the inventory-to-sales ratio across all industries since the early 1990s. There was a secular downtrend since the early 1990s, possibly reflecting the rise of just-in-time inventories. Over top of the secular trend, we see some strong cycles around recessions. It is very hard to see a level that acts as an attractor for the time series. This is perhaps to be expected; it is probably a mistake to look at the business sector in aggregate. Different industries have different conventions for acceptable inventory levels, and there has been a considerable re-weighting of industries since 1992. We should break up the aggregate to industry level behaviour, a task I may return to in later articles. As a final note, one may note that there was a mini-inventory cycle over the past few years (that I believe that I never commented on). Inventories are being pared versus sales. This is not particularly conclusive (for reasons given above), but it does suggest that inventories are not the place to look for a recession trigger. “But the crises of the past 30 years are not quite the same as those in the past. According to Kevin Harris, director for North America at 4Cast-RGE, in New York, what we mostly had in those days “were inventory and durables cycles. Managers wrongly anticipated demand, then needed to undo the mistake by reducing production, laying off employees, thereby reducing consumption and economy activity. We tend not to have those anymore. I hope you will forgive me but I wanted to respond to your piece on the Bloomberg podcast regarding the government bond market, however I couldn’t find an appropriate blog entry so I’ve posted here. I had one question regarding your explanation (note, I am thinking in terms of the UK process but I assume it is reasonably generic). As I understand it you say that the government can pre-empt any receipt of taxes or debt issuance by simply spending by creating base money and transferring it to the bank of the recipient of government spending (who is credited with corresponding broad money). The banks then seek to rid themselves of these base money reserves by buying bonds. My understanding was that in the UK only the Bank of England could create base money, and its independence meant it couldn’t simply credit the government account. I’d be grateful if you could clarify where I’m going wrong. Independence just implies the ability to set interest rates; they cannot do whatever they want. For the case of the BoE, I’ve seen arguments in market research that suggests that the Bank of England always has to honour government cheques at par. That would mean that Her Majesty’s Treasury does not even need to keep a positive balance for its cheques not bounce. I’m not a lawyer, so you will need to go somewhere else for a legal opinion. If we put that aside, central banks have a interest rate target. If there is an unwanted increase in bank settlement balances, they will try to use them to lend in the overnight market. This supply drives down market rates below target, so the central bank has to intervene to soak up the excess. This raises the monetary base. The only way to stop this effect is to pay interest on settlement balances. However, this situation means that the monetary base is meaningless; reserves and t-bills are largely fungible. My book “Understanding Government Finance” gives the long-winded answer. thanks for the response Brian. I think your first paragraph covers most of my question. Just to ensure I 'get it' let me try and repeat my understanding of what you are saying. The government always has a positive balance of bank money, which exceeds any realistic need. I assume this is built up from previous taxation or borrowing. This removes any sequential need for incomings to precede outgoings so the government can spend part of it's balance then recoup this by borrowing afterwards. Is that essentially correct? Yes. Only technical niggle it is central bank money, not "bank money," at least in the modern context. Back in the pre-Fed days, the Federal government had no choice but to leave money on deposit at banks, and so the Treasury essentially had to act like a central bank and help the banking system achieve settlement. The U.S. banking system had very large seasonal flows between the money centre banks and the regional banks due to the agricultural cycle.